We’d love your help. Let us know what’s wrong with this preview of Don't Go Where I Can't Follow by Anders Nilsen. 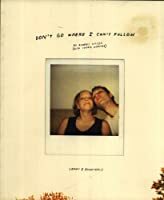 Don't Go Where I Can't Follow is a tender collection of letters, photographs, and drawings Anders Nilsen has compiled in memory of his fiancee, Cheryl Weaver, who died of cancer in November 2005. It is an appreciation of the time they shared together, and a heartbreaking account of the progression of her illness. 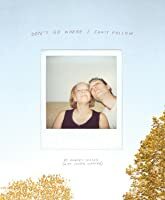 Including early love notes, simple and poetic postcards, tales of their travels together in written and comics form, journal entries and drawings done in the hospital during her final days, and a beautifully rendered tear-jerking account of Weaver's memorial, Don't Go Where I Can't Follow is a deeply personal romance, and a universal reminder of our mortality and the significance of the relationships we build. To ask other readers questions about Don't Go Where I Can't Follow, please sign up. All of Nilsen's work that I have read besides this work (Dogs and Water, Big Questions, Monologues on the Coming Plague) seems philosophical, deliberately spare, ironic, Samuel Beckett-like, stripped down emotionally and technically. Controlled, in a certain way. Not personal in any obvious sense. Maybe some people might see the work as flippant, as obviously anti-aesthetic, anti-Art School pretension. I find a kind of shyness, tenderness, vulnerability, humor in it. More philosophical than personal or political, certainly. Then this terrible thing happens to him that sort of is the personal and professional Speed Bump it would be for anyone: His girlfriend Cheryl gets cancer and dies. And they are young, in their twenties. He does what many normal people do, but maybe more artists than non-artists, he puts together a sort of memorial for family and friends based on sketches and journaling he did while she was sick, then gets help publishing it in a limited edition by Drawn and Quarterly, then rethinks this as too personal and raw and possibly giving the impression of being self-serving, and stops production. Then five years later he decides to allow a second printing. As he says, love and loss comes to us all and we need to process it in our own ways, so maybe it's okay to share his way. I thought I had a lot to say about this, but I'm going to table any attempt at a review & go hug my husband. There is so much I want to say about this book and yet I don’t think I can quite put it into words. I absolutely LOVE it. When I first saw it at our local bookstore, I flipped through it a few times, thinking, “Hmm. Looks interesting, and kind of a cute love story.” Went back in today and decided to buy it. As I chatted with Skylar (bookstore employee) about why I was buying it, I referenced my friends/family that have been impacted by cancer; I thought Nilsen’s approach would be a unique way to There is so much I want to say about this book and yet I don’t think I can quite put it into words. I absolutely LOVE it. When I first saw it at our local bookstore, I flipped through it a few times, thinking, “Hmm. Looks interesting, and kind of a cute love story.” Went back in today and decided to buy it. As I chatted with Skylar (bookstore employee) about why I was buying it, I referenced my friends/family that have been impacted by cancer; I thought Nilsen’s approach would be a unique way to tackle the subject. I braced myself for some sadness, a bit of nostalgia, and hope in the face of love and loss…but didn’t know that it would go much beyond that. Then, I read it. Twice. In about an hour. It is AMAZING. Stunning in its simplicity—some photographs, postcards, a letter, a few drawings—it captivates you in a way you don’t expect. As you flip each page, you are drawn in by its modesty as well as its significance. Nilsen’s decisions to include (and not include) snapshots of his life with Cheryl affect you in profound ways; he lets you into their little world , allowing you to feel comfortable enough to hang out with them, but honoring their privacy all along the way. As he delves deeper into the issues of illness, love, loss, and what’s left, you find yourself coming to grips with these same experiences—you are challenged, pushed, touched, changed. The brilliance of this book is that, upon first glance, it’s a “cool” mixture of mediums to tell a story…and yet, in that simple elegance, it is transformative. The photos are ones which any of us might have taken on a similar trip; the camping description, a tale we all might be able to tell. Nilsen’s ability to bring such beauty to the “normal” is the power of this book. By the time you get to the illness, you already wish you knew more about Cheryl, Anders, their world...and are extraordinarily impacted by the ways in which your own life gains deeper meaning. Most poignant and utterly beautiful (for me) are the last 30 pages. Heart-wrenching, gorgeous, just incredible …reminds us why we are all here. What a wonderful way to honor someone you love—and to honor our remarkable ability to love in and of itself…no matter how long it lasts. A rather raw scrap book compiling memories of the author with a special someone, who sadly passed away from cancer. Not quite an impressive presentation, art-wise. But still a beautiful tribute nonetheless. How do you write a review about a book like this? Anders shares with us a few key memories about the love of his life, Cheryl Weaver. If I have one valid criticism, I suppose it's that I wish the book was longer. But I figure it's rude to even ask for that-- he's let us pry into this private part of his life for long enough. This book, in its sparseness, makes you want to meet her, want to know her as he does, so perhaps this criticism is also a strength. Possibly written as a tribute to her, to How do you write a review about a book like this? Anders shares with us a few key memories about the love of his life, Cheryl Weaver. Possibly written as a tribute to her, to help conclude (in the vaguest sense of the word) his own feelings, and/or an attempt to help others who have faced similar tragedy-- this is a beautiful little attempt to immortalized her and let the world know that it lost a good person to a horrid illness. I met Anders very briefly once, and I'm certain I came off as a bumbling idiot (I think I said something to the effect of "I understand comic paneling"). "Big Questions" is one of my favorite, probably my absolute favorite, graphic novel, so I was naturally a bit nervous. I hadn't read this book yet, but I had bought it, knowing what it was about and already blown away by the gorgeously tragic title. I handed Anders a stack of books to sign; "Don't Go Where I Can't Follow" was one of them. I barely thought twice about asking him to sign it; half-heartedly, I figured that if he was open enough about it to publish the book, he wouldn't be affected by signing it. That was an ill considered thought. He signed it, kindly, with a drawing of Cheryl's glasses, without a negative word about it. Now, having read the book, I've read and obviously realized that he's had reservations about publishing this private look into his life; this should've been obvious. So, I'm sorry, Anders. Publishing this book to memorialize her and to help others doesn't mean you should have to sign it for ill-considered strangers like me. Made me cry, of course. It's a beautifully designed book, and the story is inevitably heart-breaking. It chronicles the relationship of the author with his significant other, who died while they were still engaged*. Letters chronicling their travels, photographs of their adventures, drawings of her in the hospital, postcards from one to the other. It's a bit of a mishmash, a jumble, a potpourri of memories. There's a beauty in the mixed-bag feeling. I never got the sense of who either of these peop Made me cry, of course. I never got the sense of who either of these people really were, though. I don't even know what she did as a career. And I didn't get the sense that she was particularly likable. I wonder what is missing from the apparently-longer original paperback version. That doesn't make it any less affecting, though. My favorite parts where the traditionally paneled graphic novel sections - about their hijinks getting to France and of her funeral. Makes me really hope he does some autobio work in the future. Cried in the break room at work. Poignant and good read, loved how personal it was, loved the more light hearted moments that balanced out the end, which made me cry. I think it was a little too short though. This book is a collection of photographs, letters, journal entries, drawings and ticket stubs — the catalog of someone else’s memories, archived so you can (kind of voyeuristically) look into the writer’s material life. If this is the kind of thing you collect in your own day-to-day, you'll probably like this. The book is short, and I got through it in about an hour. But there were so many details I liked that made me linger. I liked the collecting of tickets, and the compiling of lists, and the This book is a collection of photographs, letters, journal entries, drawings and ticket stubs — the catalog of someone else’s memories, archived so you can (kind of voyeuristically) look into the writer’s material life. If this is the kind of thing you collect in your own day-to-day, you'll probably like this. The book is short, and I got through it in about an hour. But there were so many details I liked that made me linger. I liked the collecting of tickets, and the compiling of lists, and the taking of seemingly mundane photographs of traffic signs in other countries (signs that you notice because the lines are very slightly different from the ones you’re used to). I'm sure this is a nice memorial for readers who knew the couple personally. The comic about the ashes is lovely, as are a few of the postcards. I was intrigued by the mix of letters, postcards, photos, and comics; I appreciated that there wasn't heavy foreshadowing or narrative hand-holding. That said, it didn't feel like all the right moments had been chosen to show us these people or make an arc. It doesn't hold together, for me, as a book for the rest of us. Perhaps the theme does some work I'm sure this is a nice memorial for readers who knew the couple personally. The comic about the ashes is lovely, as are a few of the postcards. I was intrigued by the mix of letters, postcards, photos, and comics; I appreciated that there wasn't heavy foreshadowing or narrative hand-holding. That said, it didn't feel like all the right moments had been chosen to show us these people or make an arc. It doesn't hold together, for me, as a book for the rest of us. Perhaps the theme does some work in its favor: "As we've found out, as we've been made so terribly aware by all of this, we're human. " Very poignant and interesting. Ran a huge interview with the author in The Guardian which was really interesting and made me seek this out at the library. Its a mixture of comic strip, scrapbook and photos about his girlfriend who died of cancer. Originally meant to be a small private publication for her friends and family, he then decided to publish it. One point, asking in the library where the 'adult graphic novel' section is (not one I frequent or even knew existed before last week) felt like Very poignant and interesting. Ran a huge interview with the author in The Guardian which was really interesting and made me seek this out at the library. Its a mixture of comic strip, scrapbook and photos about his girlfriend who died of cancer. Originally meant to be a small private publication for her friends and family, he then decided to publish it. This is one of the most honest and heart-breaking memoirs of love that I have ever read. Period. I should have bought it the first time I saw it at Quimby's in Chicago, and sadly it is now out of print. I actually cried in the book store as I read it. Is it better to have loved and lost? Anders Nilsen makes me think YES. ... but you don't have to take my word for it. It's hard to assign a rating to this, particularly a two star one, because it is a beautiful tribute. And that was its original intent, so I can't fault it for that. But as a total outsider, I felt really disconnected. It was too short and disjointed for me to be involved. It felt like it wasn't meant for me--and it really wasn't. This is a sweet and sad story about a fellow's relationship with a woman who ultimately dies (don't worry, that doesn't give it away;). My only complaint is that it seems so short, like read-it-in-an-hour short and almost don't-really-get-a-sense-of-characters short, too. Wow- that was hard to read but impossible to put down. The artwork is beautiful, the sentiment tugs your heart out. Well done. I can't imagine a better tribute. Gut wrenching, painful, incredible. I cannot overemphazise the simple beauty of this book, and wouldn't want to. Read when you're in a healthy and balanced frame of mind. Anders Nilsen hooked me forever with his gorgeous long and spare graphic novel, Big Questions. This book, which originally came out in 2006 with a minimal run and then again in 2012, is a departure for him. In fact, only a few pages actually involve his drawings. And yet, it is still quite powerful in its reticence. I do not want you to know the reason he has for writing this book. I didn't, and I am glad I wasn't expecting what was to come in the second half. The book entails postcards, letters Anders Nilsen hooked me forever with his gorgeous long and spare graphic novel, Big Questions. This book, which originally came out in 2006 with a minimal run and then again in 2012, is a departure for him. In fact, only a few pages actually involve his drawings. And yet, it is still quite powerful in its reticence. This is a great book just for Nilsen's vision of all the styles the encompass comics. The material is heart-breaking - the true story of Nilsen's fiancee's death from lymphoma - but Nilsen's mixing of postcards that they'd sent to each other, a letter that he'd written to his sister, traditional sequential art sequences, illustrated journal entries and captioned photographs really captured the flavor of his relationship with Weaver. Very, very heart-breaking stuff. 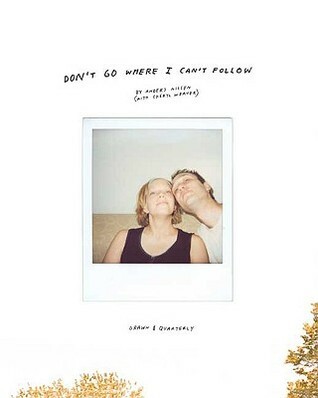 Don’t Go Where I Can’t Follow is a lovely heartbreaking book by Anders Nilsen about his relationship with his fiancee who is diagnosed with cancer. It’s more memoir and travelogue than graphic novel, a deeply moving collection of letters, photographs from a road trip, handwritten captions, journal entries, and line drawings. Expect to weep. A heartrending account of a relationship cut short by cancer. The intimate ephemera of postcards and photos intermingled with drawings was a bittersweet way to convey the potential and loss in their time together. A touching an intimate look, albeit partially, into a romance that was cut short. Painful, beautiful, and all too real. Made me feel so much. This book is beautiful and heart breaking. The story stayed with me. A collection of drawings, comics, letters, and journal entries compiled by Anders Nilsen in memory of his fiancée, Cheryl Weaver, after her death of cancer in November 2005. It opens with some postcards sent to each other and funny memories of time they spent together. As the book continues, Cheryl gets sick and deteriorates, while Nilsen continues doing what he does best - draw and write. It ends with an account of her memorial service. Obviously this book is kind of depressing. It does honor h A collection of drawings, comics, letters, and journal entries compiled by Anders Nilsen in memory of his fiancée, Cheryl Weaver, after her death of cancer in November 2005. It opens with some postcards sent to each other and funny memories of time they spent together. As the book continues, Cheryl gets sick and deteriorates, while Nilsen continues doing what he does best - draw and write. It ends with an account of her memorial service. Don't Go Where I Can't Follow is a spare and affecting work from Chicago comic book writer and artist Anders Nilsen. It's snapshots of his relationship with his girlfriend Cheryl Weaver, culminating in her sudden illness and death in the winter of 2005. By no means an exhaustive memoir of their life together, instead we get illustrative moments -- postcards they sent each other, a letter to his sister detailing a comically disastrous camping trip, a short list of Anders' faults as a fiancee. An Don't Go Where I Can't Follow is a spare and affecting work from Chicago comic book writer and artist Anders Nilsen. It's snapshots of his relationship with his girlfriend Cheryl Weaver, culminating in her sudden illness and death in the winter of 2005. By no means an exhaustive memoir of their life together, instead we get illustrative moments -- postcards they sent each other, a letter to his sister detailing a comically disastrous camping trip, a short list of Anders' faults as a fiancee. And almost before it's begun, the book is over -- returning from France, Cheryl is diagnosed with cancer and then treatments fail and then she dies. To the reader, it's devastating.